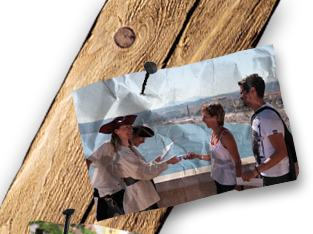 First of all, thanks to our treasure-hunts, you will discover the heritage of the city of Nice. Around the places where it is held, you will take a journey into the past and have a dream with your eyes wide open. No need for the virtual when you can experience the reality in the present moment. A healthy escape from our world of mobiles, computers and video games. Not only are you outdoors in the fresh air, you are also moving around and being mentally alert. There are many areas in our busy everyday lives, where our constant attention is required, including driving for example, that explains, in part, the loss of curiosity in our lives, which is after all .. the spice of life ! You can live in a city, even live there for ages, without actually knowing it at all. Even worse, not even seeing it as it is with its historical past, its mysteries and curiosities. At the same time, by participating in this game you will be creating another story, one to tell later. The story experienced by you and your team in this timeless zone. So, to summarize, we offer these treasure-hunts for Companies so that players can work together, establish and consolidate team relations. They are devised in order to entertain, stimulate and maintain team spirit. A good humoured experience and discovery, whilst not losing sight of the fact … so well expressed by Pierre de Coubertin, founder of the modern Olympic games that “the most important thing is not winning, but taking part”.